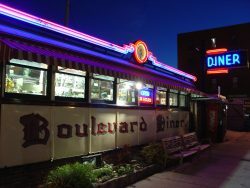 Worcester’s iconic Boulevard Diner on Shrewsbury Street celebrated 80 years of operation June 14. The diner has been operated by the George family, with the third generation now getting old enough to run the place. Congratulations to Jimmy George and his family. We still miss Ringo – Jimmy’s father.